Here comes a special request all the way from Europe! Denitsa, a reader from Bulgaria, emailed me the other day and said she needs help finding her CH foster and his kitty friend, Gaby, a home. While I know most of you are in the U.S., I also know that many of you know folks in Europe — and of course, I can’t forget Martha and Tanya! Denitsa has been fostering Jack, a lovely male CH cat, for three years, and she loves him dearly. Unfortunately, he bullies one of her cats to the point that Denitsa decided it’s time to find Jack’s forever home. While Jack may act out with Denitsa’s cat, he’s befriended another one of her fosters, Gaby. 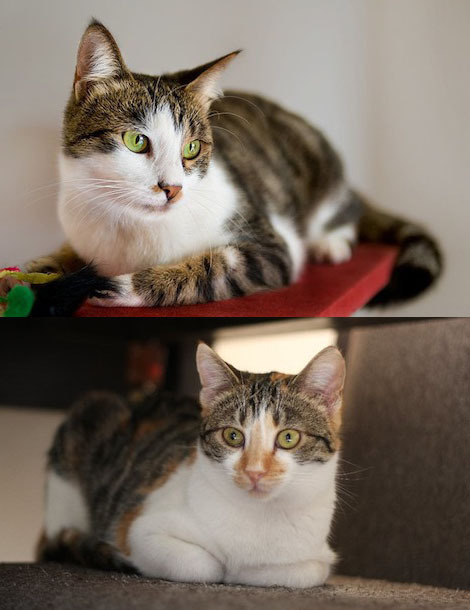 Denitsa would like them to be adopted together since they’re so bonded. 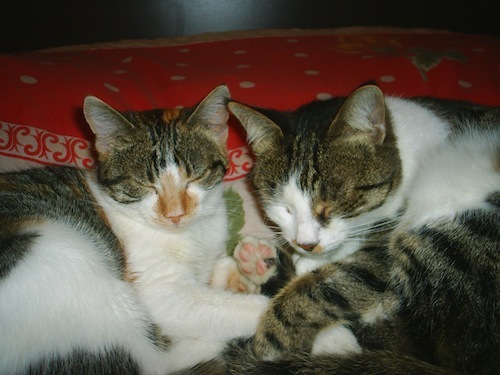 A while back, Jack and Gaby were transfered to another foster home in Austria; however, the other foster family had four dogs and their own foster cat bully, which resulted in Jack and Gaby living in a bathroom. 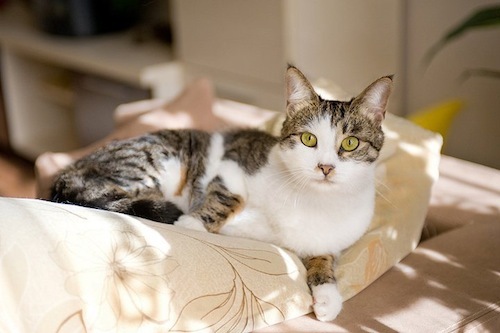 Jack: 4-years-old, very active, playful, extremely affectionate to people. He comes like a dog when called, and it does not matter what he is doing at the moment — when you call him by name, he comes immediately. He has a great affection for people. That is his greatest advantage. I am not exaggerating. The most important thing for him is really the person. He is castrated, vaccinated. Towards other cats his behavior cannot be predicted. He is not aggressive, but tends to be bossy. Also, he likes to play with other cats, but his play is very, very rough, and other cats refuse to play with him. When that happens, he gets musical — he roams the room and sings. He is a cat that needs intellectual entertainment all the time. I have 3 more cats and Jack has issues only with one of them. His CH is mild; he can jump on the sofa, but cannot climb on the cupboard. He uses his box without any problem, but he eats mainly by taking his meal on the floor or just lying beside it. Gaby: 2-years-old. She has a permanent limp in her back foot. She was found in a hole in the ground, where she stayed for several days. She had a trauma and the limping will be forever. The problem with her is she is not social with people. She prefers to keep a distance from people. She is never aggressive, never! This is the strangest thing with her. She sleeps next to me, but does not allow me to touch her. When I pick her up in my arms, she just waits for me to finish. No one wants such a cat, but she loves Jack and imitates him. They are very funny. If you’re interested in these two beauties, please let me know and I’ll put you in touch with Denitsa. Thanks! ← Do Cats Actually Like Cat Apps?